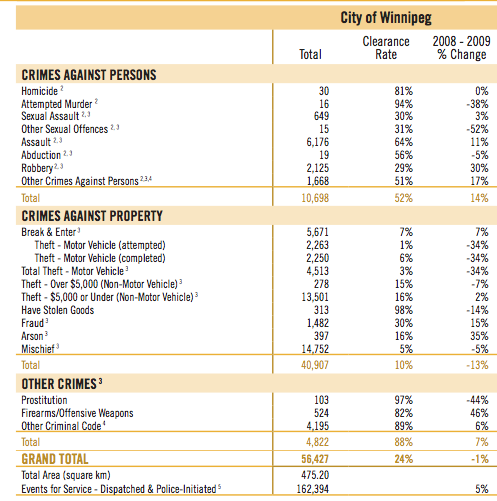 One month before 2011 is set to begin, The Winnipeg Police Service officially releases its annual report for 2009. Oddly, they’re also holding a press conference for reporters to discuss, ask questions about and dissect last year’s news. I’ll save you the trouble. There’s none to be found in it. Well, almost. Problem is it’s unfair to claim this data as reflective of anything because it’s so old. 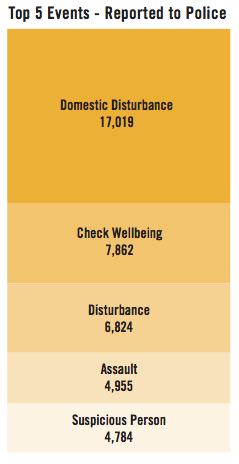 Once again, the report notes police spend a lot of their time going to domestic disturbances. It’s far and away the patrol officer’s #1 job. Homicide clearances are the same as in 2008, at 81 per cent. So, roughly 1 in 5 go unsolved. Not bad, given the gang problem in the city. 1] The number of firearms/offensive weapons crimes jumped 46 per cent over 2008 — what appears to be a jump of about 200+ occurrences. A reflection of how much more potentially dangerous the city’s become — not just for the public — but for police officers as well. 2] A spike in robberies of 30 per cent, with a clearance rate of 29 per cent. Robberies, however, were up 30 per cent last year over 2008. That’s concerning, as robberies are frequently identified by the general public as a crime they are greatly concerned about. They should be. In 2007-08, we saw a drop in robberies of about 16 per cent, but the clearance rate remained the same. Arsons were also up in 2009 — by 35 per cent — but the clearance rate a slim 16 per cent. The year before that, arsons jumped by a whopping 58 per cent, but the clearance rate was standing at about 26 per cent. Analysis has revealed that about 70% of the 5,000 missing person reports managed each year by the WPS are wards of child protection agencies. Many of these youths are chronic runaways, some with more than 150 police contacts. Research and experience has taught us that these chronic run- aways are frequently victimized, criminalized and exploited by predators while on the run from child- care facilities. That just says to me the province is offloading its responsibility to care and watch over these kids to the police service and the city. More must be done to supervise them, or the province should be kicking in more to pay for apprehending them. Better yet — one thing the province could do is detail some probation officers to a quasi missing persons unit to head out and look for these kids. Would cost less and free up police officer time to bust robbers and gun-traffickers, instead of babysit. But, who knows. It’s year-old news. Maybe everything’s changed since the dawn of 2010. 2009_wps_annual_report_english – PDF is 2+MB in size. The suit-wearing suspect just says something to me, I guess. 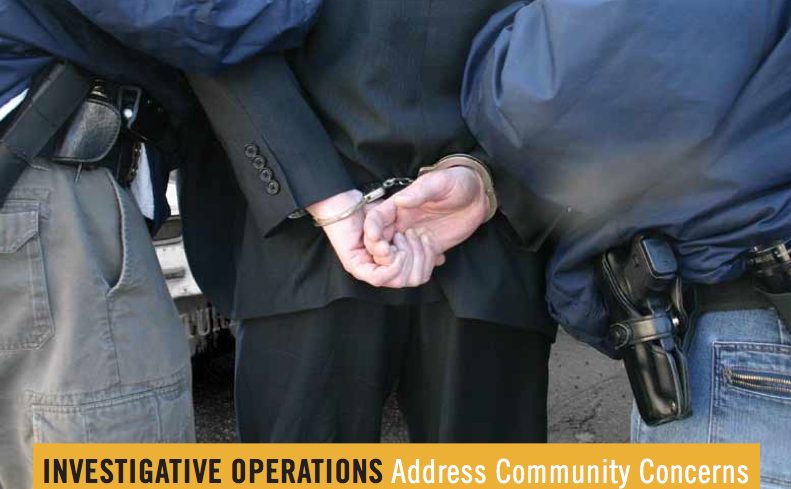 A spike in robberies can be the result of how a charge is laid, vs. what actually happened. If there’s a drunken fight between two drunks at a house and after the fight someone takes a wallet, the police will often charge the individual with robbery, when it’s really more of an assault, and then a theft. Weapons offences: Don’t forget this includes bear mace, swiss army knives, and paintball guns. It can also include charges for improper storage of firearms when officers are called to a residence. Not having a trigger lock on your 22 in the basement may or may not really be such a danger to the public. CFS and runaways? Don’t even get me started. The police are ALL about locking them up at MYC. If a kid is at MYC they can’t really run away, and it’s a great way to keep the numbers of missing aboriginal girls low- which is better for PR. However institutionalizing and criminalizing these young girls is hardly in ANYONE’s best interest. The fact is CFS is NOT caring for these girls. Social workers frequently tell lawyers ‘Well, we don’t have a place for them, so we want them to stay at MYC.” As if MYC is the always available ‘group home’ to CFS wards. We need better foster placements and we need more foster placements. That however can’t be done until more citizens who like to tout about how wonderful they are and how awful criminals are, take the time to help a kid out and give them an option instead of leaving them to the inevitable life of crime.